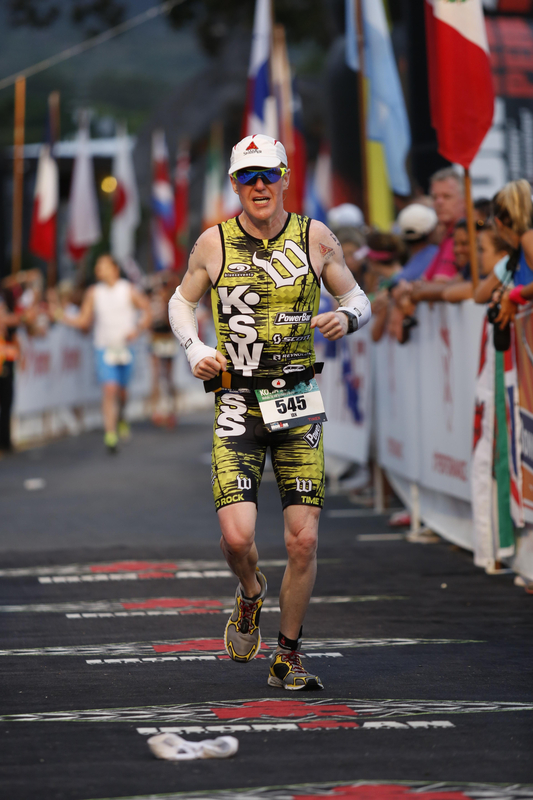 This year’s Ironman World Championship race in Kona was Ironman #13 for me. 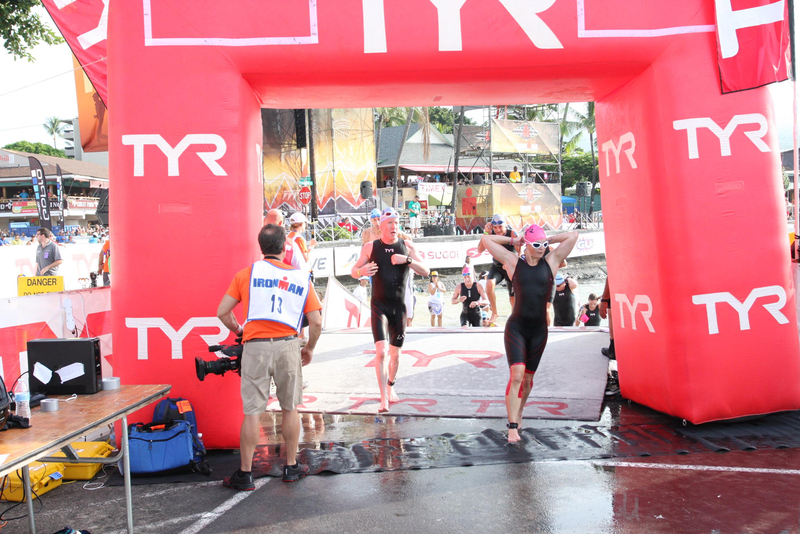 I came into the race probably the fittest I’ve ever been, at least in the swim and bike. The run was a bit of a question mark due to some persistent hamstring issues I’d had earlier in the year; I did seem to be over them thanks to my miracle worker of an ART specialist, but I didn’t have much of a base — one 20-mile run in a training camp at Tahoe in late August was my one and only run over 12 miles in the past few months. Luckily, running is supposedly my strength. 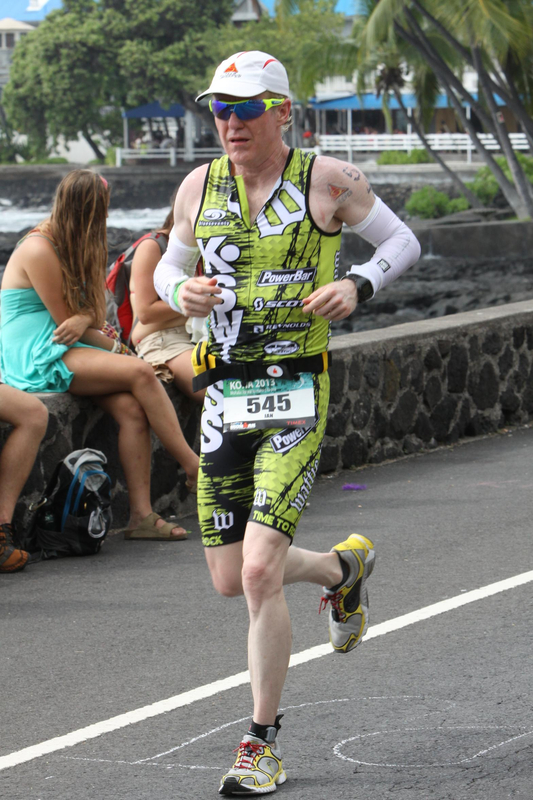 I got to the Big Island 10 days before the race in order to try to get heat acclimated. 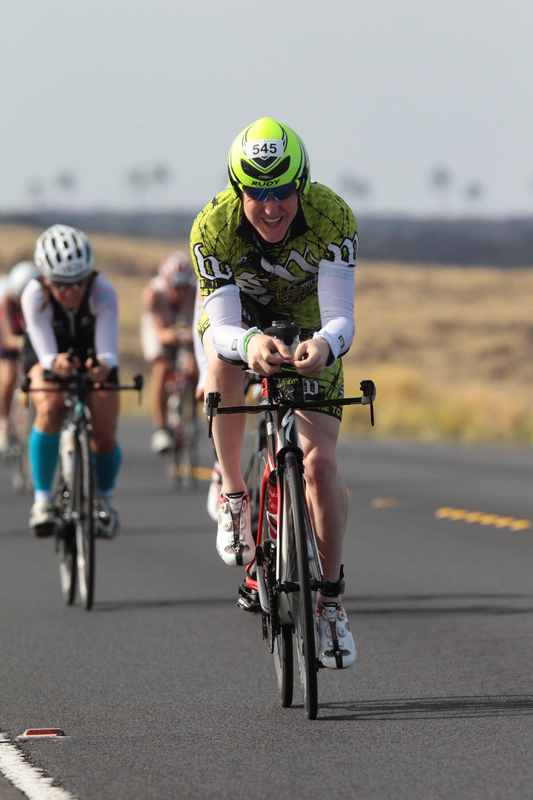 The simplest way to describe the protocol is “train 2-3 hours a day in the heat at low-to-moderate intensity.” It worked out pretty well — in particular, I got a lot of afternoon rides in on the Queen K once the wind had picked up, which is pretty much what we athletes would face in the last 30 miles of the actual race. I knew where the climbs were, and I knew to save some watts for this part of the course. Race week was a blur — lots of stuff to do (registration, expo, bike adjustments), including keeping the muscles loose with some light training. 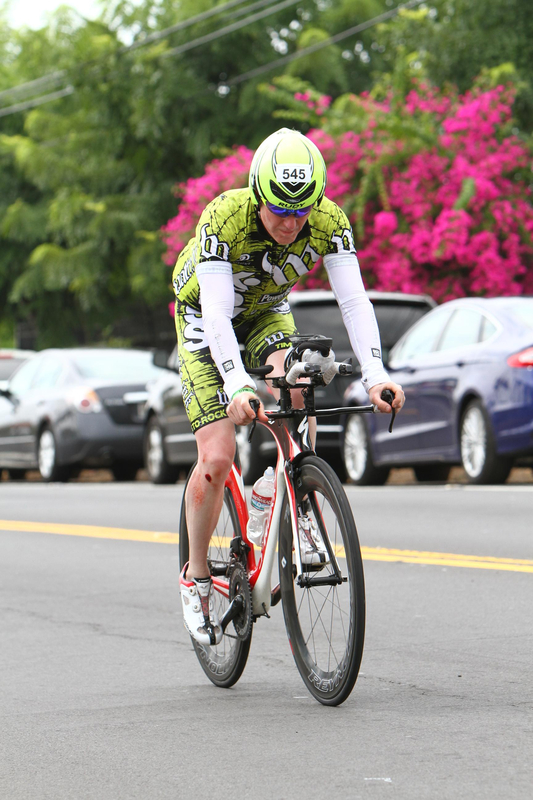 What always surprises me is how many athletes you see out on Ali’i Drive during race week just absolutely hammering their runs and bikes. Not to mention irritating the locals by not stopping at stop signs, weaving in and out of traffic, and generally acting as though they owned the place. Not to single out any particular group, but this behavior seemed particularly acute among the Euros. Saw a few friends between body marking and the walk to the transition area, at which point I got all my little tasks done pretty quickly. 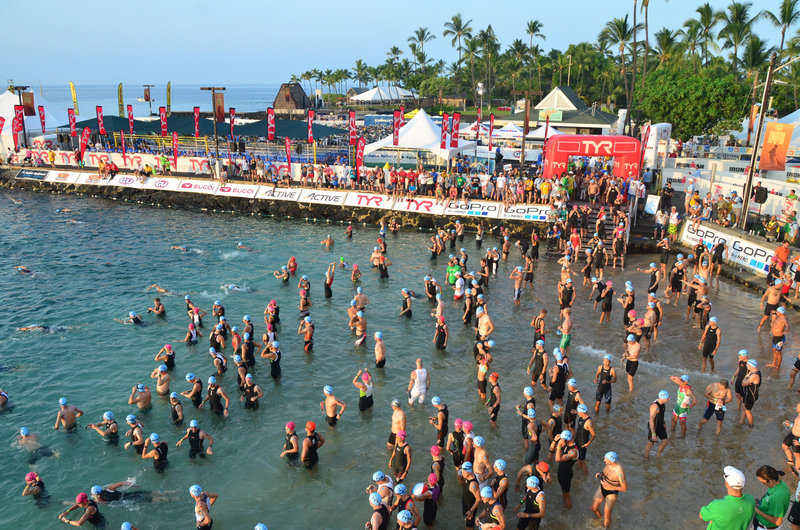 I got in the water after the pros took off, and swam out to the far left of the start where there were fewer swimmers and I could get a nice, uncrowded warmup. 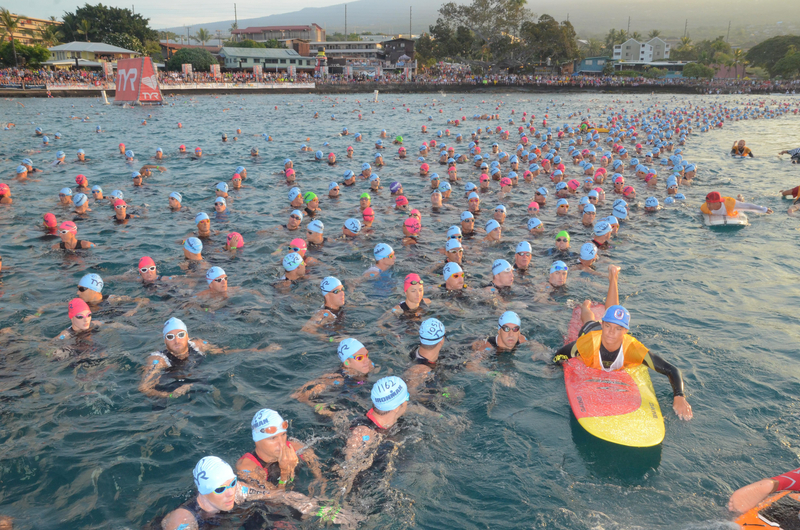 As the start approached, more swimmers started showing up near me, so I had to jockey for position a little bit, putting myself almost at the very far left and maybe three rows back. 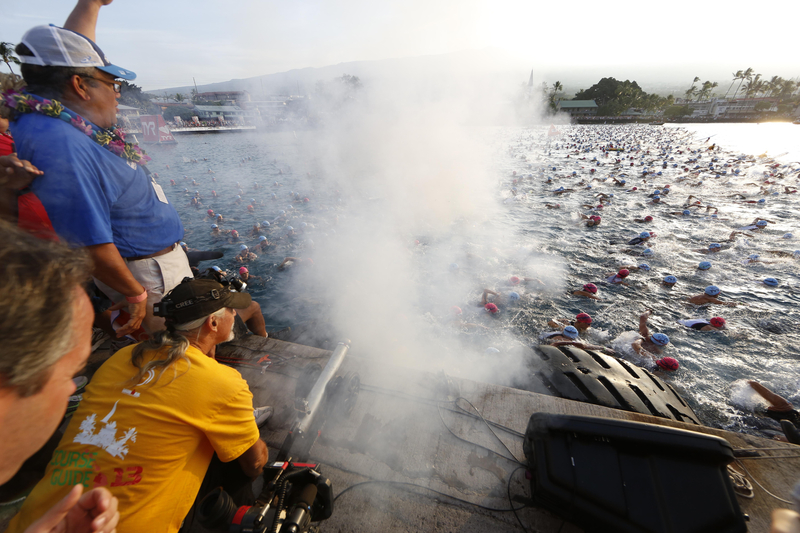 The cannon went off, and the race suddenly got very real — I was in the Ironman World Championship! 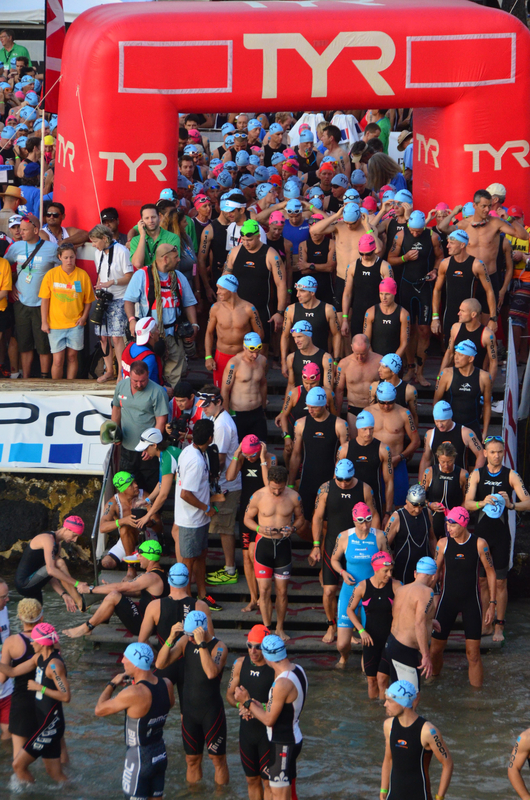 Unlike in the two other times I did this race, I seemed to have seeded myself exactly right, as I was very quickly in clear water and not getting a ton of contact with other swimmers. I found some feet to get on and just tried to keep focusing on having an efficient stroke. I reached the turnaround boat, glanced at my watch and saw 32 minutes, so I seemed to be on a good swim. There’s often a slight current against the athletes on the way back to the pier, though, but once I was on the way back the field was spread out enough where I could swim very close to the buoys without bumping into people; the only hazards were the occasional paddleboarder volunteers who had actually drifted into the course and were yelling at swimmers to stay left — they were actually in the line between the buoys and were causing swimmers to bunch up needlessly. 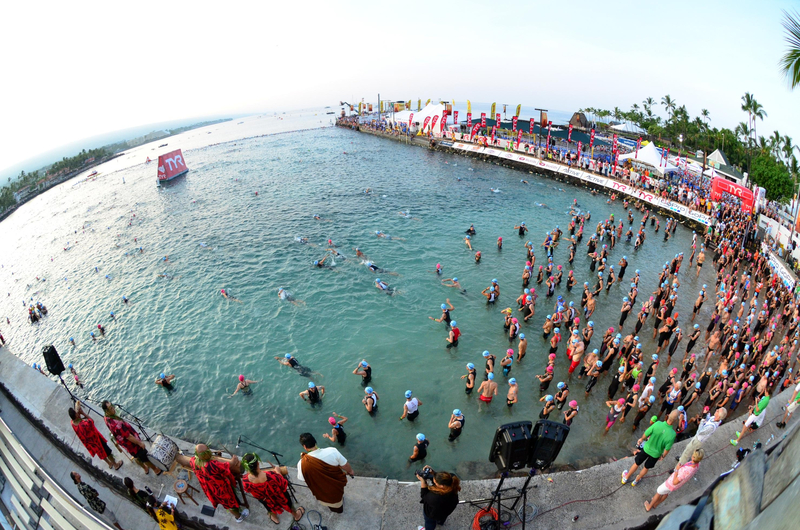 You can see the pier for quite some time before you actually get to the swim exit; I entered what I thought was the final stretch at 1:10 and change, but by the time I got to the stairs my swim time was 1:16. 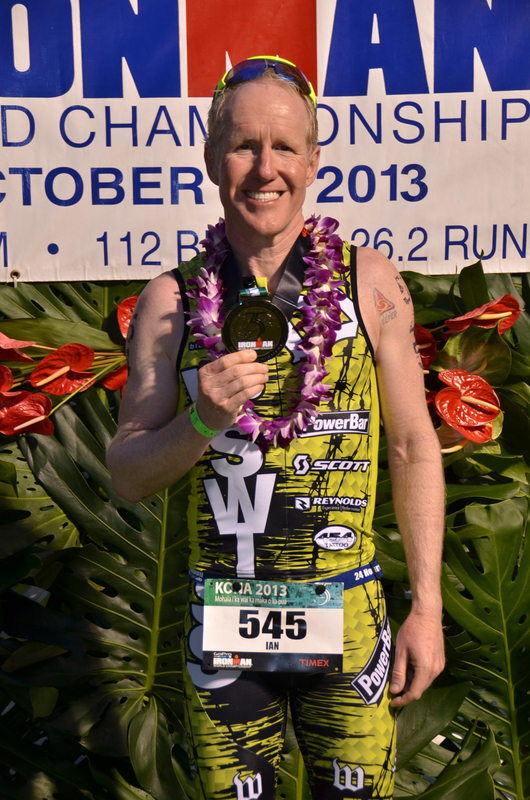 Oh well — still an 8-minute Kona PR, and what’s more, it didn’t cost me as much energy as my previous swims had. My technique work had paid off. 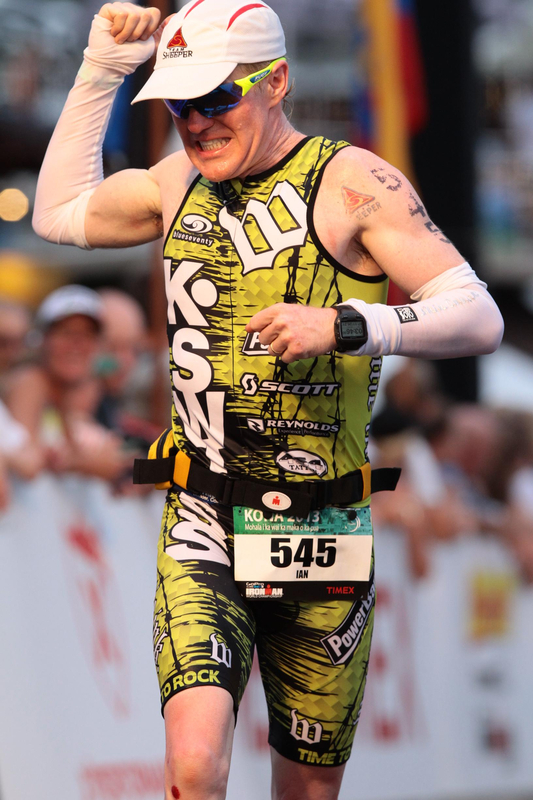 I had a pretty good transition for me — 4:32, ok considering the long run around the pier and taking the time to put on arm coolers and a bike jersey. 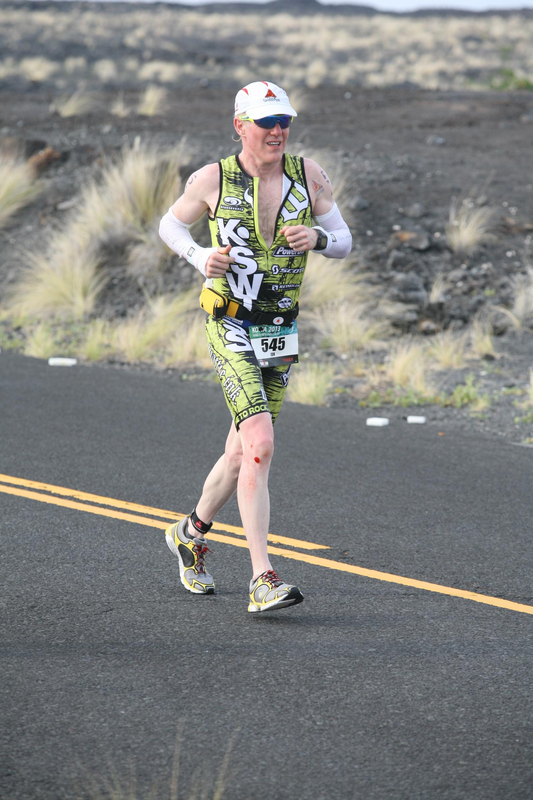 The main reason for both was to avoid a blistering sunburn; with my fair skin and the intense Hawaiian sun, I can’t put on enough sunscreen to last for the duration of the Ironman bike. The regular bike jersey also gave me some pockets I would turn out to need later. Anyway, soon I was off and riding, feeling good. The first part of the ride was fast; it wasn’t very hot out and we had a nice tailwind. 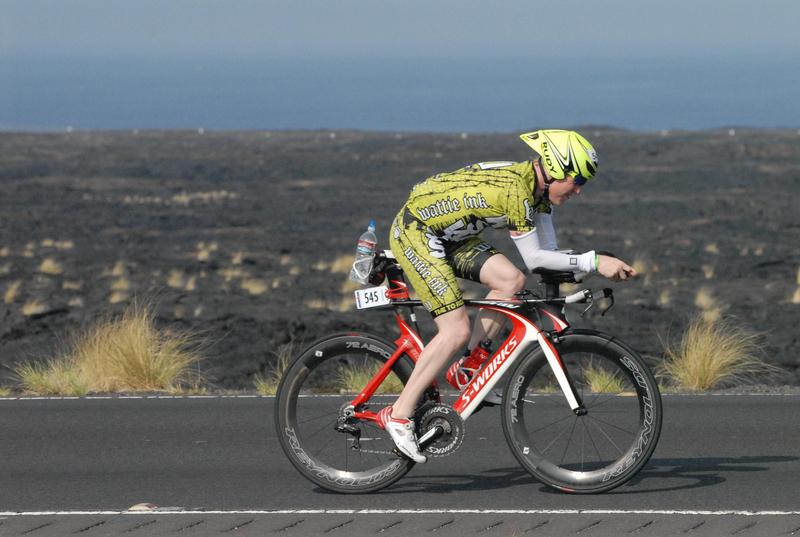 Being a slow swimmer by Kona standards relative to my bike and run, I was passing more people than were passing me, but I had to do some small surges to avoid being in a drafting position. I was riding well within my planned power output and feeling good, but around mile 35 (near Puako), disaster struck. A guy I was passing suddenly moved left (without looking) into me. I had a guy coming up on my left so had nowhere to go. I called out to the guy, but he was already touching me; then his front wheel hit my bike, and he went down, which then took my rear wheel out from under me. The next thing I knew, I was sliding on the pavement on my right leg. F**k! I had to wait for a break in the line of cyclists to retrieve my tool bag and bottle holder, and then just as I was getting my rear wheel off, the Bike Works support van pulled up. They were apparently on their way to help someone else, but they saw me first, so they did the tire change and also had a floor pump so that I didn’t have to waste a CO2 cartridge. I put the tool bag in one of my jersey pockets and left them with the now-useless bottle cage, then one of them gave me a nice “pro” push start to get going again. All told, my Garmin says I lost 8 minutes; the Ironmanlive tracker shows I lost more than 150 places in that section of the bike. I took stock of my situation; I still had a good time going, but now that I was down one bottle cage, I was going to have to approach the aid stations differently, Up until then, I had been taking up to two bottles at each station, but since my front one was a fixed, refillable Speedfil, I could only take one spare bottle each time, but that in my downtube holder, then if I was lucky I could grab another bottle and add to the Speedfil. That mostly worked, unless I missed catching a water bottle in the first pass, which happened occasionally. 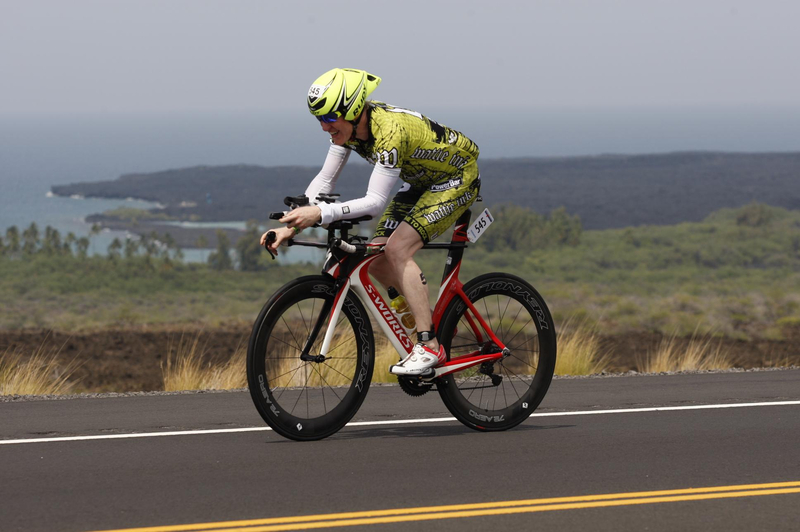 After the turn to Kawaihae, I saw the leader (I’m guessing Starykowicz) on his way back (hey, the male pros did start 30 minutes before me), followed by the chasers. 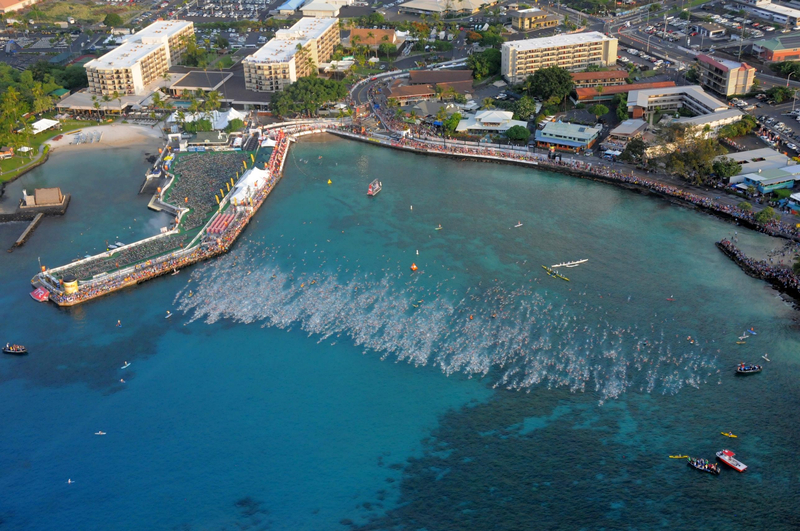 Later on, on the rollers toward the turn for Mahukona, I saw a pack of at least 50 guys — this must be the front of the age groupers, I thought to myself. Then came Packs 2 and 3. Ironically, I had draft marshalls near me, and here you had these massive packs going the other way. Hard to say if they were intentionally cheating, but it definitely didn’t look legal, which was disappointing. 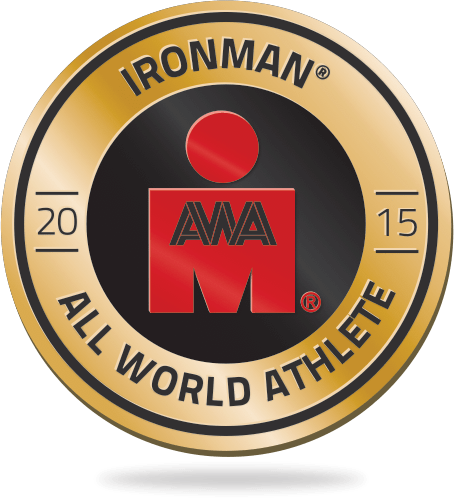 Short of having more drafting marshalls out there, it’s not clear what Ironman can do to cut down on what seems like blatant cheating. The good news was that I was almost to the turnaround at Hawi before I even realized it — there were none of the usual winds, either headwind or crosswind. I did pull over briefly after the turnaround to adjust my front quick release; it felt as though my front wheel might have been a little askew after the crash. That cost me another minute, but since there was some fast downhill coming up, I thought better safe than sorry. The return trip from Hawi is where the work usually begins, and this year was no exception. The wind started picking up on the rollers to Kawaihae, and then we worked the biggest climb of the day — the short-but-steep slog back up to the Queen K.
There’s a really nice beach park down there. You’ll also note from my CP 180 that I negative-split the ride from a power perspective. So sometimes I do actually practice what I preach. My VI (Variability Index) was also quite even at 1.04. 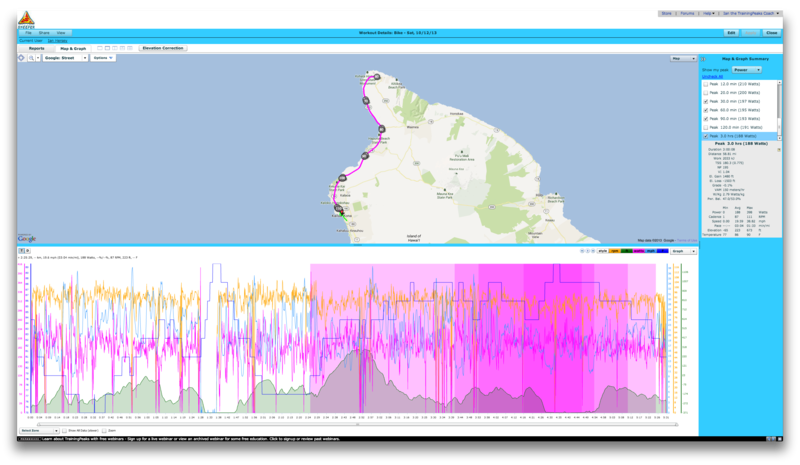 Moreover, the Queen K section (the last 35 miles) is where I picked up over 200 places, so my “save some watts for the Queen K” strategy worked out pretty well. 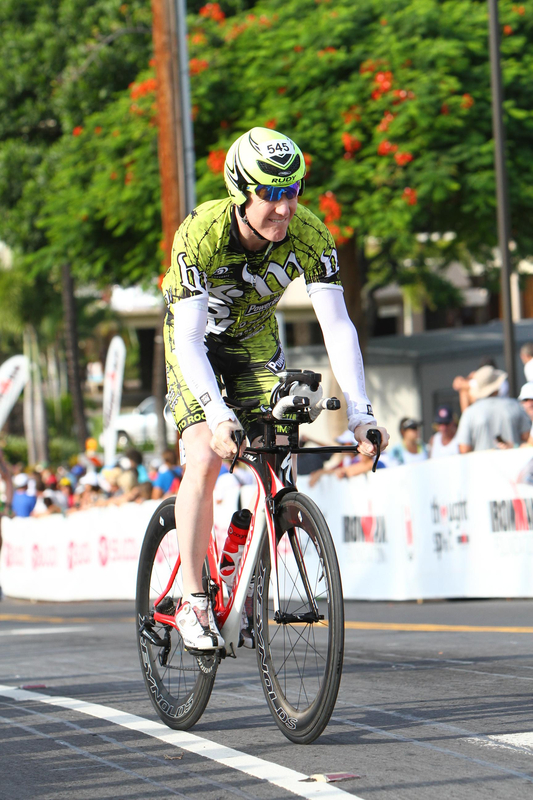 My bike time was 5:31, which was over 20 minutes faster than I’d ever ridden in Kona, so I was pretty happy with that considering the 9 minutes I’d lost in total to the crash. What I wasn’t sure of was how well my hydration had gone since losing the rear bottle cage, but I figured I would find out sooner or later on the run. I got out on the run course at 6:57 into the race — earlier than in any Ironman I’d ever done except for two of my three Ironman Arizona races. So despite everything, this was going to be a quick day if I could put together a decent run. Initial signs were good; sub 7:30 pace felt awesome for quite a few miles. 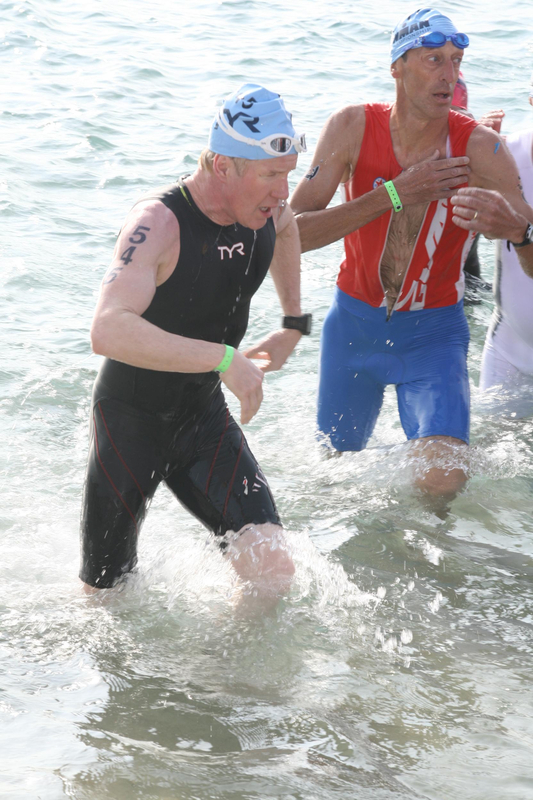 But early enthusiasm often leads to mid-race problems. 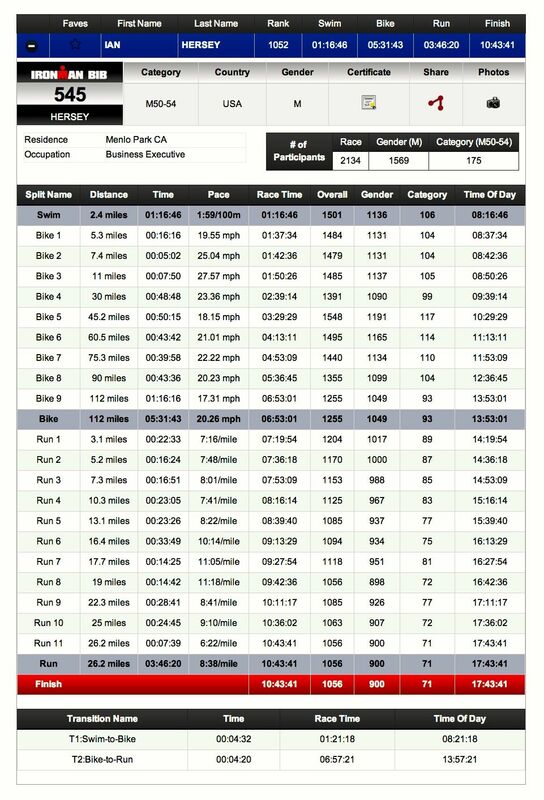 I had a great first 10 miles, then caught my struggling teammate Matt around mile 11, but I started having my own struggles after the halfway point, which I reached in 1:43. Repeating a theme from countless previous races, it was hamstring cramps — the kind that stop you dead in your tracks. I thought my fluid intake had been pretty good, but Houston, we had a problem. Rather than focus on the negative, I tried to figure out what I needed (“fluids”) and how best to get enough of them in (walk the aid stations and take whatever it is they were offering). The cramps were pretty stubborn; I had to walk a good section of the Energy Lab, and even the running part was none too quick. Eventually, the fluid intake did take effect, and I was able to keep myself on the verge of cramping instead of actually cramping for the rest of the run. I did pick up a number of places in the 7 miles from the Energy Lab back into town even though I felt as though I was struggling. At this point, I figured that if I could keep going, I could break 10:50, so that became my revised goal. Underpromise and overdeliver — it’s not just a business cliche. 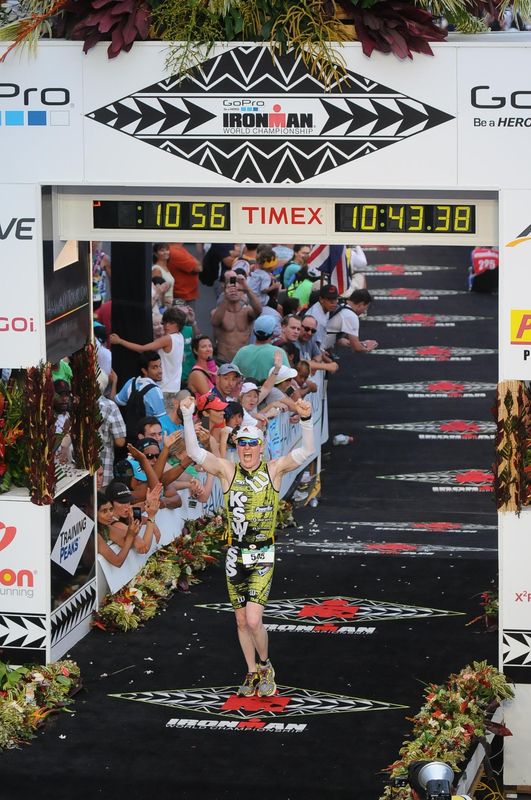 It turns out I was able to pick up my pace a little, so I kicked it in down to Ali’i Drive and ended up finishing right behind the legendary Ken Glah, in 10:43:41. Aftermath: chafed, bloody, blistered and tired. But ready to take this one on again in the future and do better. Great race report, as usual, Ian. And a great race. You put a lot of work and planning into this one and it showed in the results. Looking forward to seeing you at St. George. You sure look happy in your pics! Great preparation led to a great race. Well done.